A modular management solution that combines stylish profiles and elegant accents with top-grade fit and finish. Abrasion- and stain-resistant high-pressure laminate with elegant hardwood trim. Grommets on worksurface for cable management. Full-extension file and 3/4-extension box drawers ride on steel ball bearing suspensions. Drawers lock to secure contents. Desk and Return sold and shipped separately?ORDER BOTH. 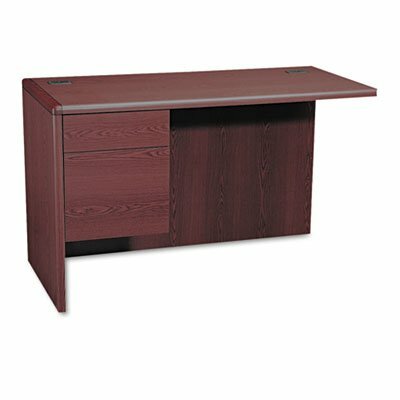 Color: Mahogany; Pedestal Count: 1; Drawer Configuration: Left: Box/File; Overall Width: 48". Grommets on worksurface for cable management. Full-extension file and 3/4-extension box drawers ride on steel ball bearing suspensions.